Cruelty free Easter eggs! These are fun if you have little ones or even for yourself. 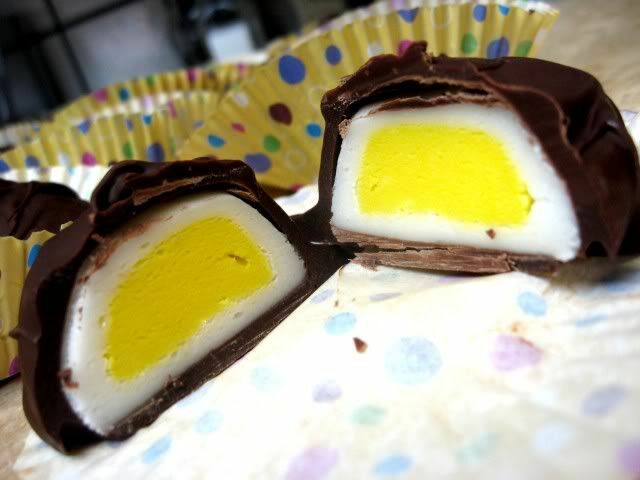 They are slightly reminiscent of those Cadbury ones, but the filling is not nearly as runny. These also make a mean peppermint patty, so you don't have to wait until Easter to enjoy them! As a matter of fact, you can sub any flavor into the center and make a variety of chocolates. In a bowl, mix together corn syrup and vanilla. Begin adding in sugar one cup at a time. Work in the sugar until you get a dough that is the consistency of play-dough. Divide into thirds. Add yellow food coloring to 1/3 of the dough. Divide that 1/3 into 12 even pieces and roll into small balls. Dust with extra powdered sugar as you work to prevent them from getting too sticky. Place on a sheet of parchment or wax paper and set aside. Divide the remaining 2/3 into 12 equal pieces and form into small patties. Once again dusting with powdered sugar as you work. Add one "yolk" into the center of each patty and wrap the patty around it. Form into an egg shape, Dusting as you work. Place on parchment or waxed paper and place in the freezer to stiffen up before you dip them in the chocolate, about an hour or so. While your "eggs" are freezing, you can melt your chocolate, either on a double boiler or in the microwave. 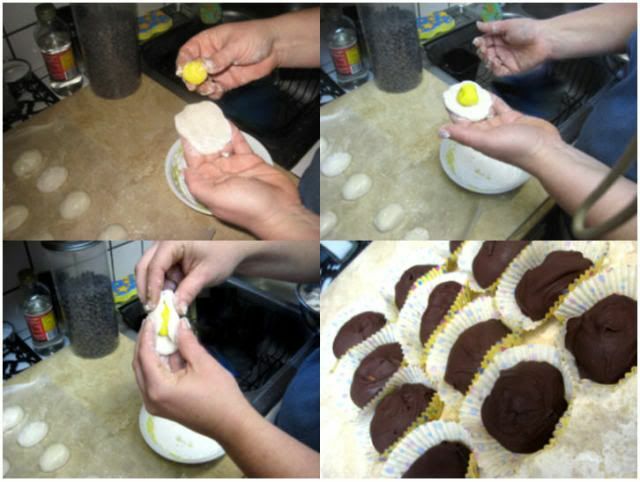 Dip each egg in chocolate and return to wax paper to cool and harden. You can place them back in the freezer to speed up the process if you'd like. Peppermint Patties: Instead of dividing into thirds, add 2 tablespoons (30 ml) of peppermint extract to the corn syrup and vanilla before adding the sugar. Add a little green food color (optional). Divide into 24 equal pieces and form into patties. Follow the recipe from there. Get creative with the flavors! Add 2 tablespoons (30 ml) of lemon or orange (or almond or anise or cinnamon...) extract instead of the peppermint. Add a touch of yellow or orange natural food color, or whatever color matches the flavor you use to make a variety.